Okay, I haven’t done so well at posting one thing I’m thankful for every day this month. Ã‚ Oh well, I have tried to conciously take time each day to thank God for at least one thing. Here we are a couple of days prior to Thanksgiving and I have a few pretty significant things to post about for which I’m thankful. Ã‚ Today I’ll tackle some of them in list form and I’ll have a separate post tomorrow, then I’ll be absent for a few days as we celebrate Thanksgiving with family (you would have never known if I hadn’t said something, it’s not like I’m here all that often these days:-)). 1. Ã‚ I’m thankful that I took the opportunity to participate in a Bible Study Fellowship class this year; I’ve talked about joining a BSF study a few times the last couple of years, and finally made the commitment back in September. Ã‚ We are studying the book of Matthew, and I have been blessed by the lectures, the group discussions, and most of all by the time I have spent in the Word of God. Ã‚ I am thankful for the leaders who give so much time to make the study what it is. Ã‚ I am thankful for the other women who participate (especially my group) and speak life and truth into each other’s lives. Ã‚ I am thankful that God is using this study in my life and the lives of so many women across the globe to draw us into deeper relationship with him. 2. Ã‚ I am thankful that we will be able to spend time with Matt’s family this Thanksgiving; his parents, sister, and brother live about 10 hours from us, so we don’t see them as often as we would like. Ã‚ I’m sorry that we won’t get to spend time with my sister-in-law and her family; they will be missed. Ã‚ However, I’m thankful that the reason we won’t see them is because she is about 4 weeks from delivering a brand new, healthy, adorable nephew for us. 3. Ã‚ I am thankful for good friends. Ã‚ Over the last several years Matt and I have lived in cities where we are not near family, and our friends have become like family. Ã‚ I am thankful for my friend Nicole who I left behind in East Tennessee, but who I still talk to regularly and see when we have the chance. Ã‚ I had a very tough time when we first moved about 2.5 years ago, so I am thankful for my friends in our current city who have made living here a great experience. Ã‚ I am thankful for the chance I had to eat lunch with my friend Diane last week. Ã‚ I am thankful for the time I was able to spend with several of my girlfriends on Sunday. Ã‚ I am thankful for the way our lives touch, the way we interact, and the way God has blessed my life with such wonderful women. Here we are again in a new week and with a new list of things to be thankful for. Day 10, Saturday: Not in high school anymore – Ã‚ Saturday evening I attended my 10 year high school reunion. Ã‚ It was nice to see some people who I haven’t had the opportunity to see in many years, but I was reminded once again how glad I am that I’m not in high school anymore. Ã‚ I’m thankful that I don’t have to deal with the popularity stuff, the cliques, and all of the other things that seemed so important when I was walking through that time period. Day 11, Sunday: Safe travel - Ã‚ In order to attend my reunion Matt and I travelled to Nashville and back home this weekend. Ã‚ I am thankful that God watched over us in our travels during this trip and so many others. Day 12, Monday: My bed – Ã‚ Yesterday I was thankful for my soft, cozy bed, a clean toilet, and a husband who was willing to stay home from work to tend to Little while I struggled to keep anything in my system. Ã‚ It was a rough day filled with stomach virus fun, but we made it through to the other side. Day 13, Tuesday: A good sleeper – Ã‚ Today (and so many days in her life) I am thankful that Little is a good sleeper. Ã‚ Her sleeping habits allow Matt and I to sleep through the night (for many months now) and me to take a nap in the afternoon if I need it. Ã‚ Today I definitely needed the nap as I continue to recover from my bout of yick yesterday. I am thankful for our parents, siblings, and extended families. Ã‚ I am thankful that Matt and I can still spend time with 7 of our 8 grandparents. Ã‚ I am thankful that we enjoy being with our parents and siblings. Ã‚ I am very grateful that I have wonderful in-laws whom I love and who welcomed me into the family with open arms. I am thankful that Matt and I were both raised in Christian homes. Ã‚ I am thankful for the legacy we’ve received from our parents and grandparents and that we are trying to pass on to our children. I am thankful that our family is supportive, encouraging, and Ã‚ loving. Ã‚ I am thankful that we know we can turn to them any time we need them. Ã‚ I am thankful that they love our child(ren) so much. Today I am thankful for our family and the time we will get to spend with them in the coming weeks. Wow, where has this week has gone! ?Ã‚ I’m a wee bit behind on my Giving Thanks days, so I will play a bit of catch up here and cover days 3 through 8. Ã‚ Some of these may be a bit superficial, but they are, none the less, things that evoke gratefulness. Day 3, Saturday: A fresh laundry room – My wonderful husband spent Saturday afternoon painting our laundry room the loveliest shade of green. Ã‚ It is called “pea pod” although Matt refers to it as “grass”; that should give you an idea of the color since I was unable to get a good picture. Ã‚ The best part is that he did all the work while allowing me to lie on the couch napping. Ã‚ I’m telling you, he is a great catch! Day 4, Sunday: A beautiful day – Ã‚ The weekend and Monday were gorgeous days. Ã‚ We had clear blue skies, temps in the 70s, and a nice little breeze blowing. Ã‚ It was a great weekend to be out and about running errands and playing.Ã‚ Although those won’t be the last days in the 70s here (it is supposed to be warm again this weekend), they were wonderful days before our days in the 50s on Tuesday and Wednesday. Day 5, Monday: A healthy girl – Ã‚ Little had her 15 month check-up on Monday and got a great report. Ã‚ All of her milestones have been met or exceeded, she’s grown an inch and three-quarters since her 12 month check-up, and she is gaining weight (although she is still on the small side based on growth charts, oh well, she’s been consistent). Ã‚ Right now she is fighting a yucky cough, but we have no long-term health or developmental concerns, and that is a great blessing. 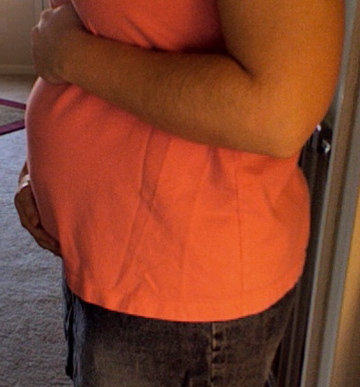 Day 6, Tuesday: A stay-at-home Mom – I am so blessed to be able to stay home with Little – and baby Boo in days to come. Ã‚ I try to step back from time to time and realize that I am only able to do this because God has blessed Matt with a good job and Matt and I have been committed from the start to me being at home. Ã‚ I love being home, and even though the days get long and hard from time to time, I wouldn’t want someone else to enjoy all the fun that Little and I get to have together. Ã‚ I am also grateful for my stay-at-home friends with whom we can hang out. Day 7, Wednesday: Smoke without fire – Ã‚ Yesterday afternoon I was very thankful that there doesn’t have to be fire for there to be smoke. Ã‚ I was preparing to make a chicken pot pie for dinner and thought I could boil the chicken while Little and I went outside to play with the neighbor’s children. Ã‚ Apparently I did not watch the time closely enough, because when we came home I opened the front door and was greeted by smoke and a nasty smell. Ã‚ The pot had boiled dry and the chicken was quite burnt, but fortunately, it had not caught fire. Ã‚ I immediately took the pot off the stove and put it outside, and we spent the next hour or so trying to air out the house with windows and doors open. Ã‚ We are dealing with a lingering smell, but no serious effects. Day 8, Thursday: Tiny little movements – Ã‚ I’ve begun to feel the first tiny little movements that let me know Boo is kicking and doing okay. Ã‚ This is so reassuring for me during the time between morning-sickness subsiding and the big ultrasound. Ã‚ We go for the ultrasound a week from Monday, and I’m so excited to see this little one for the first time. For all of these things and so many more I thank God. Ã‚ He has truly been good to me. The lovely Susan and Janice at 5 Minutes for Mom are hosting an amazing Christmas Giveaway. Over the next two weeks they will be posting a series of contests to win some great prizes – just in time for Christmas giving (or just to keep for yourself). If you are interested in playing along, click the “Christmas Giveaways” button in my right sidebar or click here. You are currently browsing the archives for the Fall Festivities category.